Gemma Vassallo is a Yoga Alliance certified E-RYT 500 and YACEP (Yoga Alliance Continuing Education Provider). She is Level 2 Baptiste Power Yoga certified and has studied with Shiva Rea’s senior teachers (plus many more inspirational teachers) and brings a unique modern flair to her classes. Born and raised in Sydney, Australia, Gemma moved to France in 2014 and is now well established in Paris. She runs workshops, teacher trainings and retreats in Paris and worldwide, and was blessed to have been featured on the cover of Esprit Yoga Magazine (January 2016) Due to many past injuries and surgeries, she became intrigued by the human body and managing her own injuries (particularly the low back), which comes through in her teaching. She studied Nutritional Medicine which included 2 years of anatomy study, giving her a great foundation of knowledge on top of yoga teacher training skills. Gemma also has extensive experience as a Wellbeing Consultant in the corporate sector and she is a certified Wellness Coach. Gemma brings a wealth of knowledge to her classes in a fun and inspiring way. Her vinyasa classes are powerful, creative and challenging whilst her yin yoga classes are deep, soulful and potent. She is living her dream to empower and inspire individuals on their yogic and wellness journey. 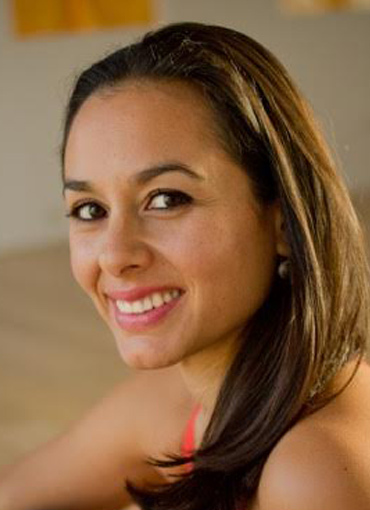 Gemma Vassallo is a Yoga Alliance certified E-RYT 500 and YACEP (Yoga Alliance Continuing Education Provider). She is Level 2 Baptiste Power Yoga certified and has studied with Shiva Rea’s senior teachers (plus many more inspirational teachers) and brings a unique modern flair to her classes. Due to many past injuries and surgeries, she became intrigued by the human body and managing her own injuries (particularly the low back), which comes through in her teaching. She studied Nutritional Medicine which included 2 years of anatomy study, giving her a great foundation of knowledge on top of yoga teacher training skills. Gemma also has extensive experience as a Wellbeing Consultant in the corporate sector and she is a certified Wellness Coach. Gemma brings a wealth of knowledge to her classes in a fun and inspiring way. Her vinyasa classes are powerful, creative and challenging whilst her yin yoga classes are deep, soulful and potent. She is living her dream to empower and inspire individuals on their yogic and wellness journey.